Your message will be sent to Majdi Khatib. South Orange County has been home to Majdi since 1987, and he and his family have lived in Laguna Niguel since 2003. In addition to his REALTOR ® designation, Majdi earned a Bachelor of Science degree from the University of California, Irvine, and a Masters in Business Administration from California State University, Fullerton - MBA at the Spectrum Program. Majdi spent the first 10 years of his career in marketing and sales management for top companies in the medical diagnostics field, including five years with Quest Diagnostics. He was responsible for the launch of several innovative products and trained company sales personnel and traveled to meet clients to introduce the products. In 2002 he earned the President's Award at ChromaVision Medical Systems, now Clarient, Inc., for … "outstanding contributions and dedication to ChromaVision" … "Teamwork, Bias for Action, Quality Results, Customer Focus, Integrity, and Respect" … " commitment to excellence and project leadership has led to the on time release of a strategically important product." Majdi's driving ambition and spirit of entrepreneurship led him to start a new venture, and in 2004 he and his brother founded a successful technology company in Irvine. Coast to Coast Technology is now a leading edge provider of technology-focused business solutions for small and medium size businesses, educational institutions, and government agencies. His passion for working with people motivated Majdi to apply his experience, education, and skills into a new career in real estate and he chose to do it with one of finest and most successful real estate firms in the country, Berkshire Hathaway HomeServices California Properties. He is now a licensed REALTOR ® with the company in their Laguna Beach-Treasure Island office. 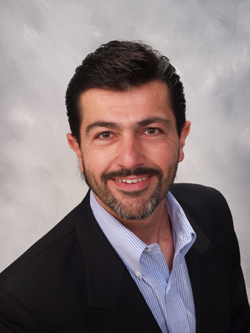 Majdi earned his California Real Estate Sales Person's license in 2010 and Broker's license in 2013. Also, in 2013 he earned the distinguished designation of a Certified International Property Specialist (CIPS). He has always found time for community service and volunteers with local non-profit organizations. He previously served as Vice President and Board Director for the National Parkinson Foundation, Orange County Chapter in Newport Beach, CA. With his wife and two children, Majdi spends free time taking advantage of all the wonderful local beaches, hiking trails, mountain destinations and other attractions that Southern California offers.